I have compiled a short list of a few places locally and nationally that have special offers for the special dad in your life. There are definitely many options for this special day, but these are a few within different price ranges for the special man in your life! 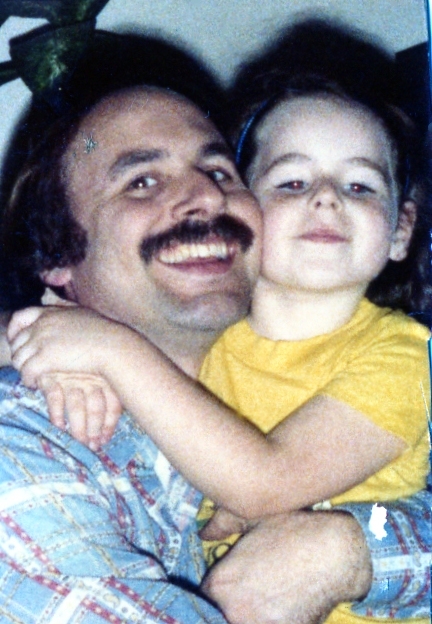 Happy Father’s Day Daddy! I love you!! 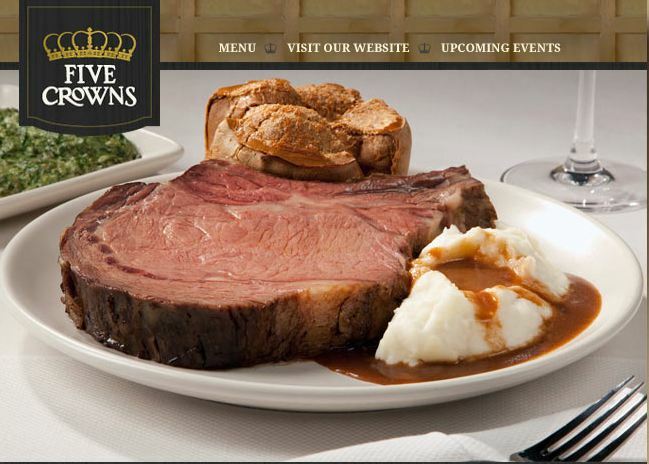 First place here on my list is The Five Crowns in Corona Del Mar. This restaurant is very special to me and they always have something special to offer. There is a Father’s Day Menu that can be viewed here. I am a Lawry’s VIP member for this restaurant…which is a great thing to have! It costs $25 to join and you get your $25 back on the first purchase you make and for every $250 you spend, you get a $25 gift card, as well as free appetizers and salt and pepper shakers on your anniversary and on your birthday! Great place to go!! Next, there is Savannah Chophouse in Laguna Niguel. Their event is called the BBQ & Beer Brunch in the daytime for $32.95/person with bbq ribs, bbq chicken, prime rib, and Southern style chili. In the evening, there will be bbq dinner specials and buy 1, get 1 free drink for dad! 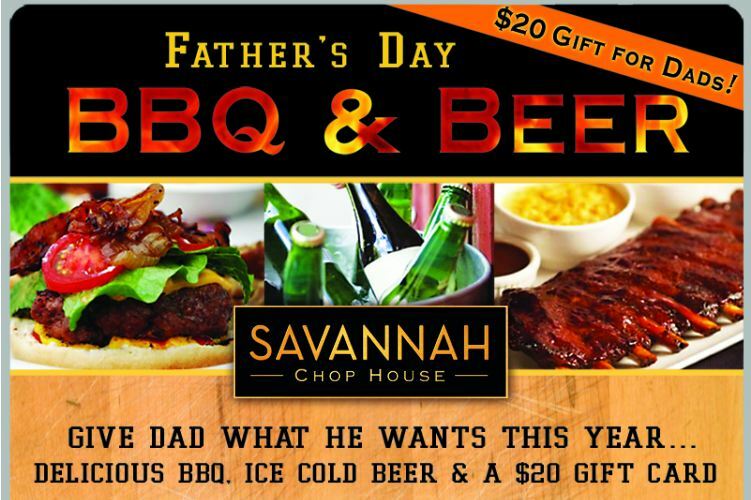 Every dad that visits Savannah Chophouse for dinner on Father’s Day will receive a $20 gift card for a future visit! Check out their website HERE for more details. 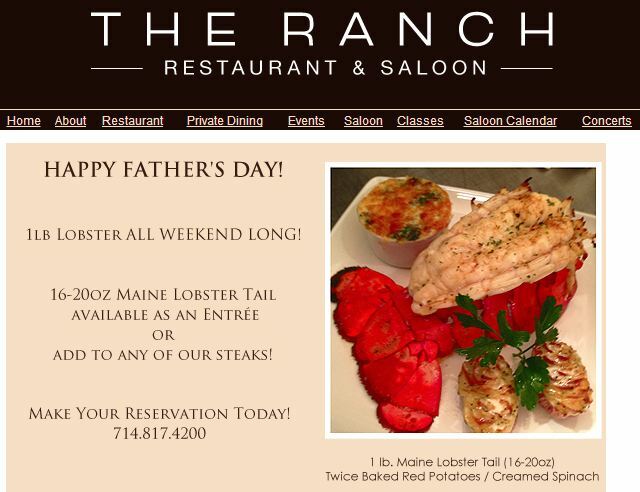 The Ranch in Anaheim (literally one of the best restaurants I have been to in Orange County, California) is offering 1 pound lobsters! Everything is fabulous in this restaurant! It is conveniently located off of the 5 freeway, close to Disneyland. See my husband’s review HERE for more specifics about different dishes! This place is a gem. Tamarind of London is one place I have never been that I definitely want to check out soon, but it looks like they are having some fabulous deals as well or Dad’s Day! 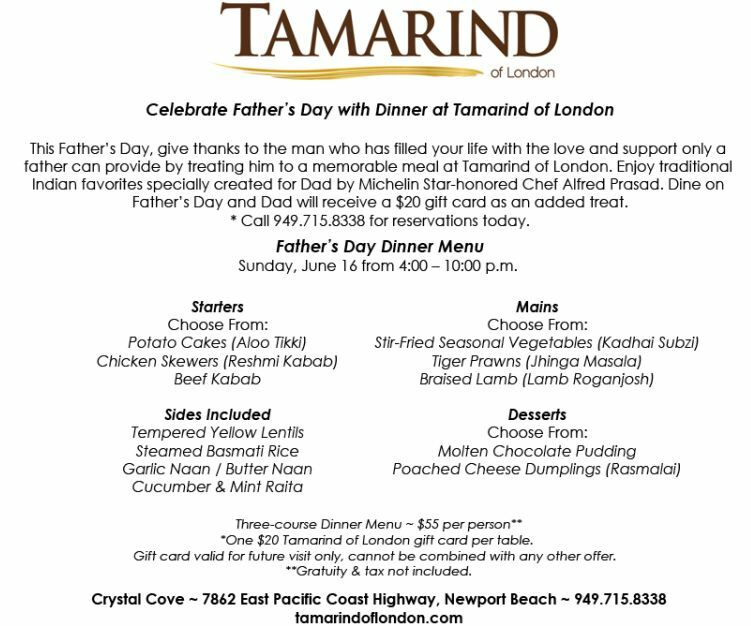 There is a 3-course dinner menu being offered for $55/ person and each dad walks away with a $20 gift card for their next visit to the Tamarind of London located in Newport Beach, California (location closed). A classic favorite that is a little more pleasing to your wallet would be Macaroni Grill. 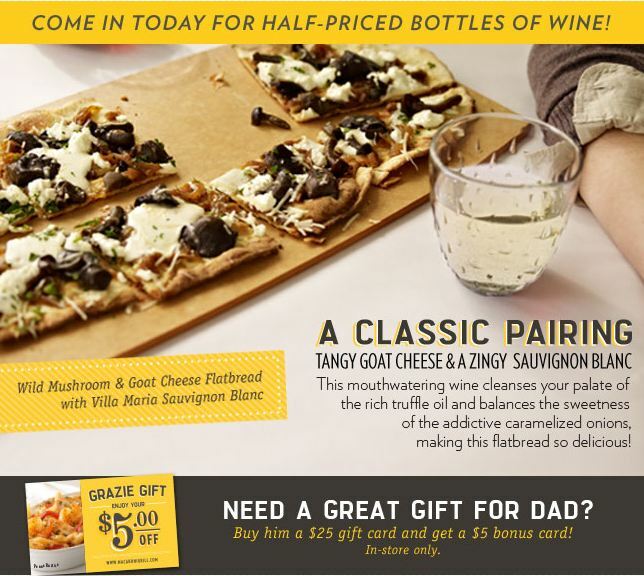 They have an awesome deal going on right now on half priced bottles of wine, so being a wine lover myself, I must announce that oneJ In addition to their wine special, right now if you purchase a $25 gift card as a gift or dad, you can get a FREE $5 bonus card…No complaints there. 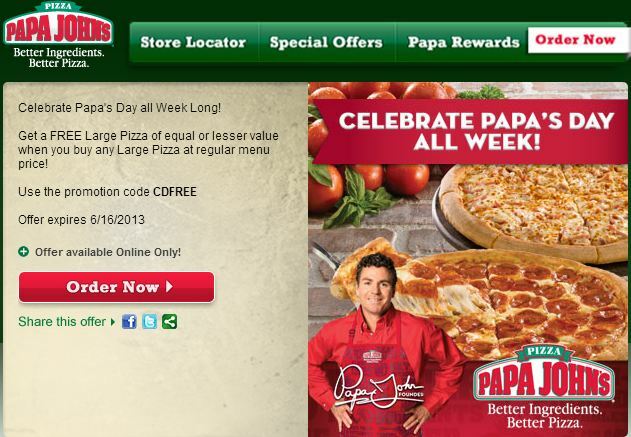 Even a bit more economical are two deals, one from Papa John’s is a code that can be used anytime between now and Father’s Day to buy one large pizza, get one free and a coupon code for El Pollo Loco that allows you to get a free large side dish with any 3-course family meal. Stuck on gift ideas??? 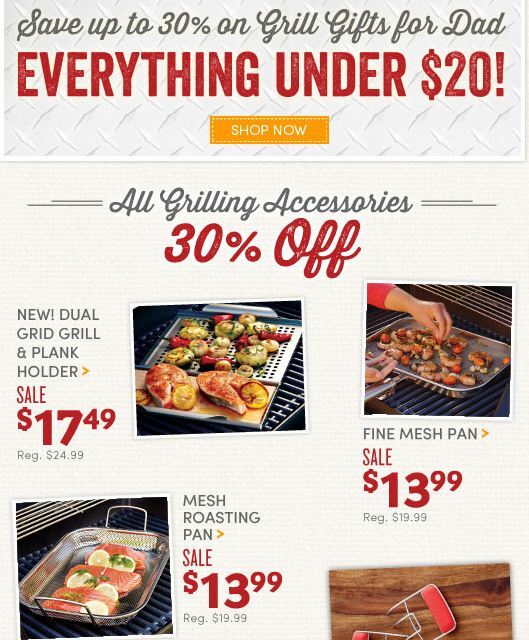 How about 30% off all grilling accessories at Cost Plus World Market? This store always has awesome stuff, but grilling accessories, especially at a reasonable price could make a great gift for dad! 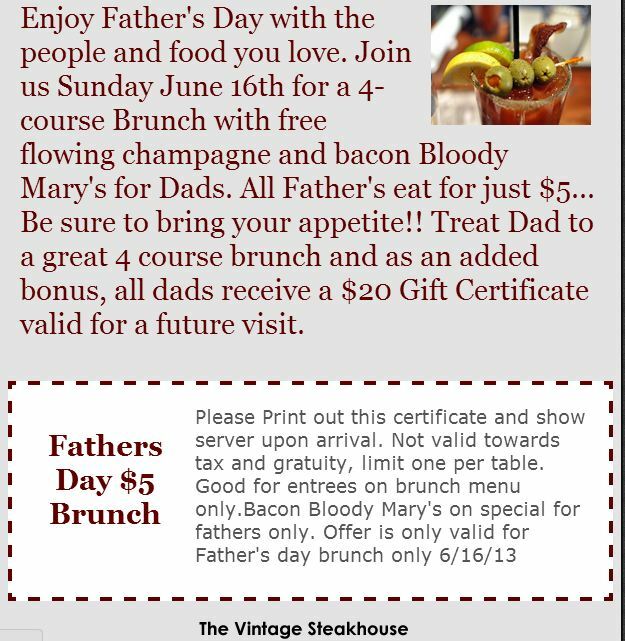 I hope one of these Father’s Day ideas can work for you…I am leaning toward the Vintage Steakhouse one…I mean how can you beat it?? Buy the lunch and the grilling supplies and you still are on an economical budget at a fancy restaurant with your fabulous dad! 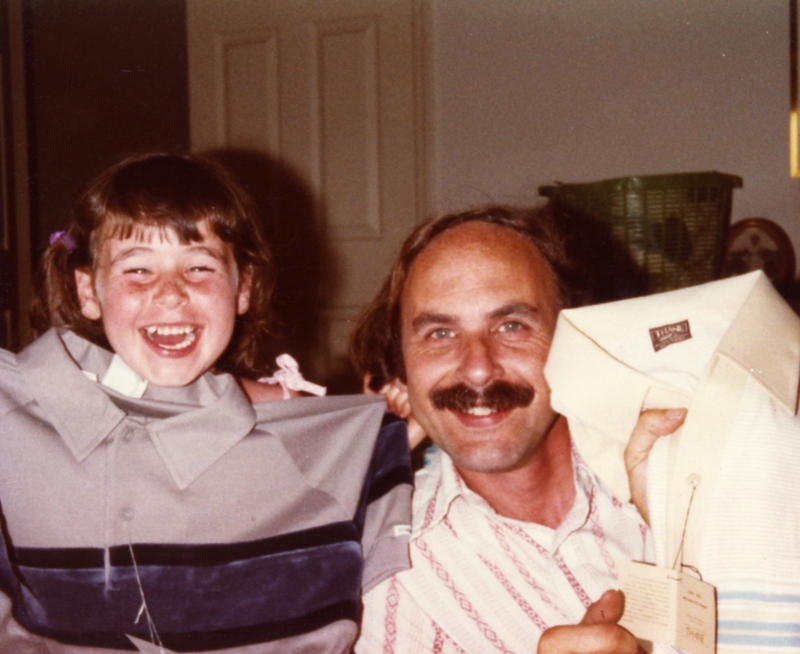 Happy Father’s Day to all of you fabulous men out there!! Wow – I have a daughter that has just had her first birthday and can see my life flash in front of me as i scrolled down your post!! 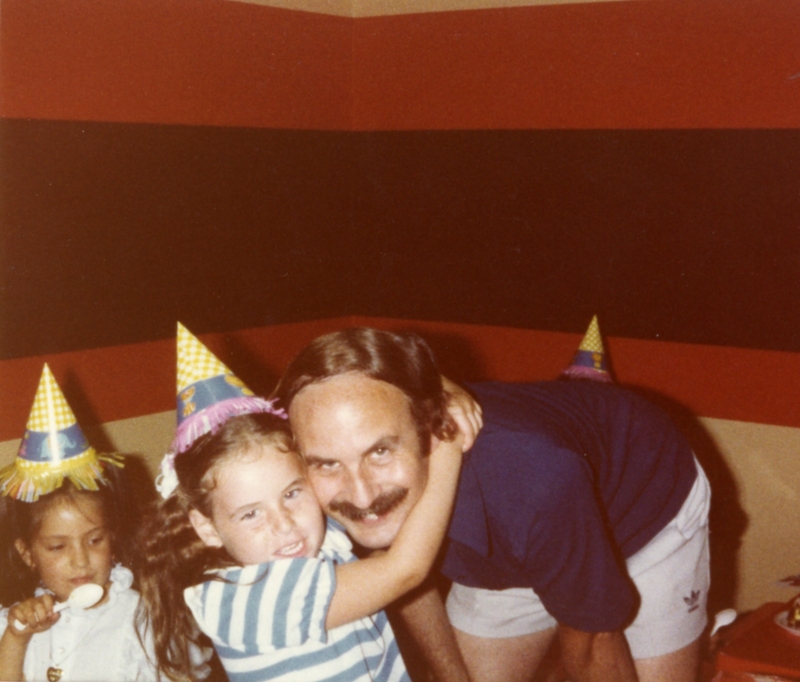 Wonderful memories for you and him and only hope i can look back in the years ahead with my own “Daddy’s girl”. This is a beautiful tribute to your dad. 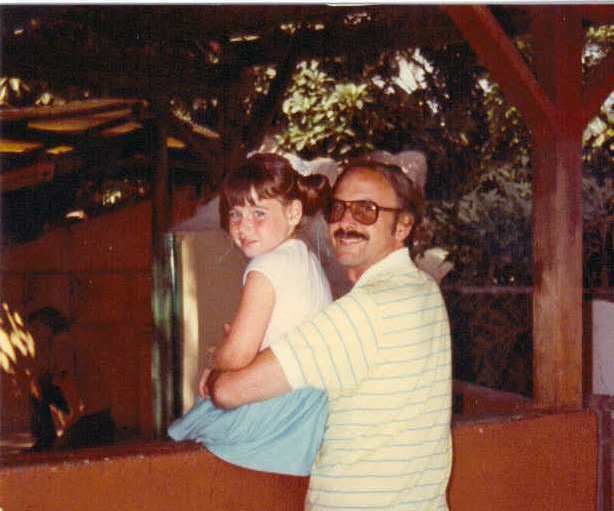 My dad is 800 miles away and I don’t see him often, so honored him in my blog this morning, too! http://www.roadrunnerfloristbasketexpress.wordpress.com I hope everyone enjoys their dad this weekend, and if your dad is no longer with us, may his memory be a blessing. I like that! 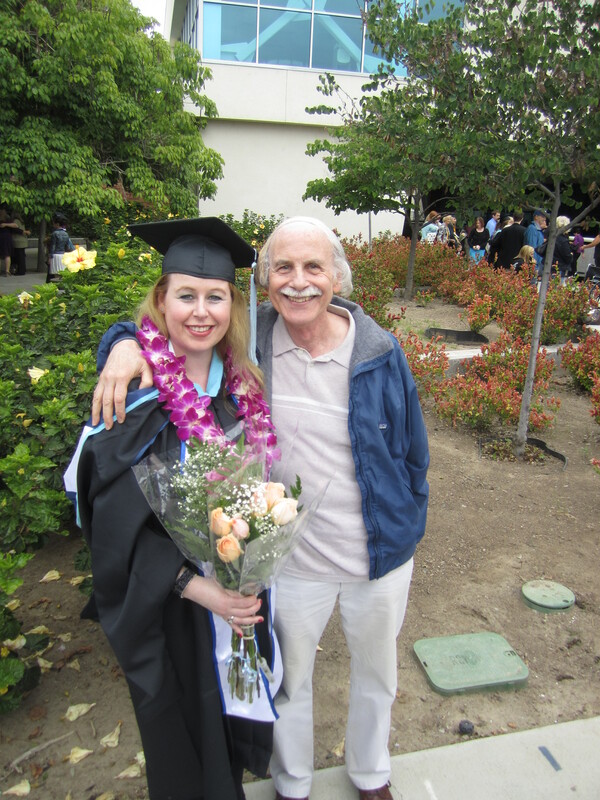 Thank you so much for sharing:-) Dads rock! These posts are lovely.. I will try to find a restaurant in my area with such fun and great food !! Great post to your dad! Thanks Rob! Happy Father’s Day! My dad is so hard to buy for especially since we don’t live in the same city. I’m thinking of getting him something totally different from the usual. Thanks for the great tips. It is difficult. Maybe check out the grill items 30% off sale that I posted about at Cost Plus Imports:) Great variety there! Jennifer, I am so sorry to hear about your dad. That is so awesome that you will get to celebrate father;’s day with your awesome husband and kids though:) Have a great Father’s Day! Love the pictures of you and your dad.. Thanks for another great post, Dani. 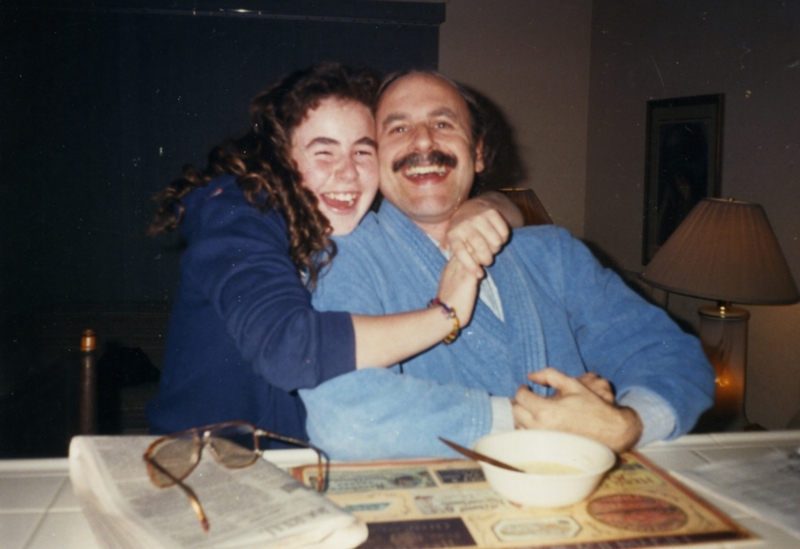 Love your pics and feel fortunate I still have my dad. 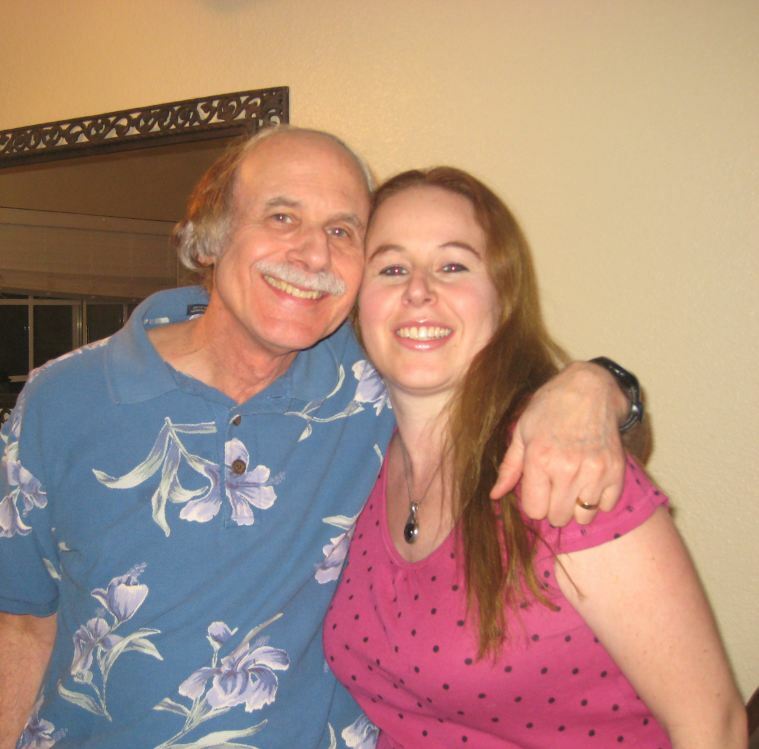 Nice pics with your dad! My daughter has just passed her 1st birthday and your wonderful pictures are hopefully like a fast-forward of what we will look back on in the distant future. My Dad lives thousands of miles away physically but is next to me in spirit!! Love you Dad. Wow! You’re super blessed to have your dad living only 15 miles away! Mine lives in Michigan, and I live in Florida… I don’t even know how many miles that is! haha 🙂 But it’s too far. I get to see him like 2x a year. That is so awesome you still get to see him two times a year! 🙂 Thanks for the comment! Happy Father’s Day! OMG, I simply love this blog! Such great ideas I spent way to much time checking everything out and checking out what I lost out on, lol. I will be coming back not to mention this is such a great idea for all the single parent families out there, I will be sharing! Obtaining all the great places to go to with savings no less for father’s day makes this even better! 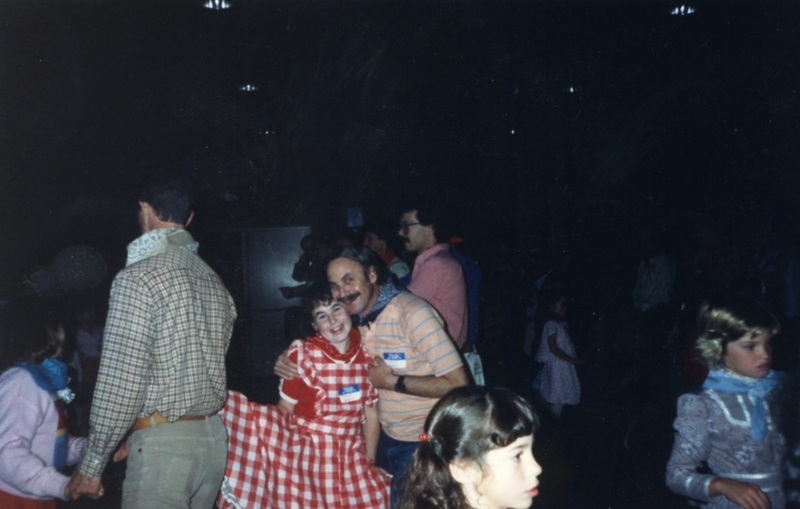 Lol… at the first Girl Scout Square Dance Event organized by yours truly..